NATURAL MATERIALS- The serving bowl and utensil set is made of solid bamboo. This ensures that they are ecologically friendly, lightweight and bacteria resistant. The natural finish is sure to compliment almost any home décor. UTENSILS INCLUDED- This sleek and modern salad bowl comes with two, easy-to-grip forks for serving and tossing salad other foods. The forks are shaped to comfortably fit your hands and easily grab food to transfer from the bowl to your dinner plate. MULTIPLE USES- This bamboo salad bowl and utensil set is not only great for serving food at meal time, it’s also ideal to use as a decorative centerpiece. 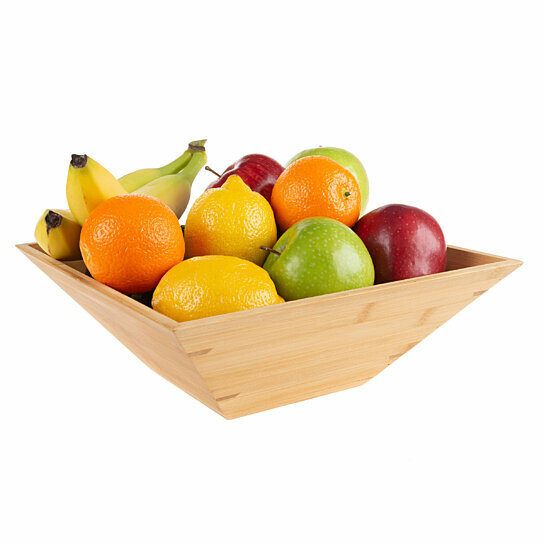 You can use the bowl to display fruits or decorative items throughout your home. EASY TO CLEAN- This serving bowl set is a breeze to clean. Simply wash with a soft, damp cloth or sponge and soapy water and allow to air dry completely to keep your kitchen and serving set looking beautiful. PRODUCT DETAILS- Materials: 100% Natural Bamboo. Bowl Dimensions: 11” L x 11” W x 4” H. Utensil Dimensions: 7.25” L x 4” W x .75” H. Color: Natural Finish. FDA Certified Food Safe.